Mark your calendars now for the annual Gospel Sing to be held at Saint Clair Memorial Hall in Greenville on September 9, 2012. The concert starts at 7:00 pm. and lasts until 9:00 p.m. Individuals, church congregations and all of the public are invited to come and share this fun, worshipful time. A freewill offering will be taken and all proceeds will go to the Cancer Association of Darke County to help cancer patients in Darke County battle the difficult disease of cancer. More information will be coming weekly. You won’t want to miss this special event! The format has changed and there will be different styles of singing ~~ something for everyone! The Cancer Association partners with United Way and is not affiliated with the American Cancer Society or other organizations. Please call Christine Yount, Executive Director for any questions regarding the concert or the association. 937-548-9960. Fort GreeneVille Chapter recently held a storytime at the Gathering at the Garst encampment tent of DAR member Karen Burkett and husband John. The storytime was based on "The Lewis and Clark for Kids" book written by Janice Herbert. The Burketts were in period dress in order to give a visual of the Lewis and Clark time period. Also included in the storytime was a craft time, making of an Indian buffalo mask. Afterwards there was a drawing for a copy of the book to one of the storytime participates. The book was donated by the Garst Museum Gift Shop towards the chapter's literacy program. Twelve children participated along with eight chapter members. Governor Kasich has appointed Thomas E. Zitter of Fort Recovery (Mercer Co.) to the Ohio Rail Development Commission. 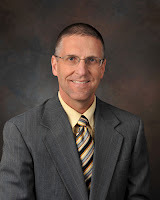 Mr. Zitter is an active member of the Mercer County Republican Party and is a frequent attendee to Darke county events. The Ohio Rail Development Commission is to develop, promote, and support safe, adequate and efficient rail service for the state of Ohio. Maintain programs of investigation, research, promotion, planning and development for rail service and provide for the participation of private corporations or organizations and the public in the development, construction , operation, and maintenance of rail service. Term is 6 years and is appointed by the Governor and confirmed by the Senate. There are 7 commissioners. Tom represents the Public sector. ORDC provides grants, loans and other assistance. It plans promote, and implement the improved movement of goods and people faster and safer on a rail transportation network connecting Ohio to the nation and the world. Its mission is to be accomplished through a coordinated freight and passenger rail system which is an integral part of a seamless, intermodal transportation network contributing to Ohio’s quality of life and economic development. The Tri-Village Key Club class of 2011-2012 has donated funds to assist the Friend of the Shelter for the building of the dog park in Darke County. On Sunday, May 20, 2012 a car wash was held at K-mart in Greenville with the proceeds designated for the dog park. The Tri-Village Key Club is a chapter of Key Club International. It is the oldest and largest service program for high school students. It is a student led organization that teaches leadership through service to others. The Key Club is sponsored by Kiwanis International and performs act of service in their community. Darke County Friends of the Shelter was just one of many local organizations that benefited from the Key Club's efforts. 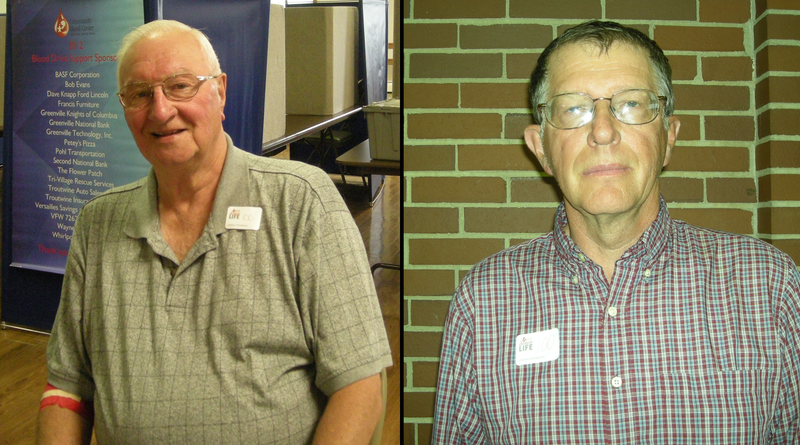 DARKE COUNTY, OH — (July 26, 2012) Community Blood Center congratulates all of the following donors for reaching their milestones. Thanks to the generosity of all donors many lives have been saved. On July 30, 2012 at approximately 2124 hrs. 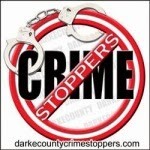 the Darke County Sheriff’s Office was advised by Randolph County Indiana Sheriff’s Office that they had recovered a 2004 Ford Taurus, which had been stolen from Darke County on July 17, 2012 from Klipstine Rd. in Versailles, Ohio. The suspect, Robert Scott Kindred, who was the possible suspect in stealing this vehicle, was located with the vehicle sitting at an abandoned residence on County Road 400 E, just south of County Rd. 100 S, in Randolph County. Kindred was taken into custody by the Randolph County Sheriff’s Office on a warrant out of Darke County for Failure to Comply with Order of a Police Officer (F3) and Receiving Stolen Property (F4). Darke County Sheriff’s Deputies and Miami County Sheriff’s Deputies have been searching for Kindred since the July 16th incident which involved several law enforcement agencies in searching for Kindred after he stole a vehicle and was in a pursuit with Miami County and Darke County Sheriff’s deputies, which led to Kindred bailing out of the vehicle and fleeing on foot. Kindred was transported to St. Vincent Randolph for medical reasons after being arrested by Randolph County Sheriff’s Deputies for being in possession of the stolen car and the active warrant out of Darke County, Ohio. Kindred was then transported to Reid Hospital in Richmond for further treatment. Kindred is still in custody of the Randolph County Sheriff’s Office until his release from Reid Hospital where he will then be held at the Randolph County Sheriff’s Office until extradition is signed, then he will be returned to the Darke County Sheriff’s Office for his current charges. Charges are pending with the Randolph County Sheriff’s Office. The capture of Kindred is a huge relief to the residents of Darke County after several incidents involving Kindred in stealing cars from the Darke and Miami County areas. Thanks go out to the Randolph County Sheriff’s Office for their efforts in locating and apprehending Kindred for these crimes. “Annie of the North” Tour- Reserve your Spot Now! Wouldn’t you like to know where Annie Oakley grow up? Where did Annie first learn to shoot? Where did Annie’s family live or worship? Did Annie go to school? When Annie became famous, did she ever come home? Your Versailles Area Historical Society wants to help answer all your questions about the life of our most famous daughter, Miss Annie Oakley. That’s why we are inviting you on a tour that we call “Annie of the North” The story of our own Phoebe Anne Moses. On September 8, 2012 from the luxurious comfort of a charter motor coach we will travel the winding back roads of Darke County to learn about the legendary Annie and her early years. Local travel entrepreneur, Sue Christian will serve as hostess for our journey with emphasis on making you feel at home. Local Annie experts, will share the facts and lore that most of us have never heard about our local hero. We will make several stops along the way and several other special guests will share their stories as well. Our last stop will be at the Winery at Versailles for you to purchase refreshments to refresh yourself and a surprising connection to Annie herself! Because of what we anticipate to be a great demand for tickets, we are offering two options. The first family friendly trip will depart the museum located at West Street, in Versailles at noon. This will include the tour and return our guests to the museum at about 3:00 p.m. The cost is $15.00 for VAHS members and $18.00 for non-members. The second trip, recommended for those 21 and over will depart from the Winery at 4:00 p.m. and include all the activities of the first trip plus a fantastic finish! We will attend the Thrill of the Grill, a tradition at the winery where each guest will enjoy a delicious fresh salad, homemade bread, a choice of a 12 oz. N.Y. strip steak, or a 7 oz. Marinated Chicken Breast, or a 6 oz. Salmon, a large baked potato, mixed vegetables, a fantastic dessert and a bottle of wine per couple or 2 glasses of wine per person. We will be in a semi private dinning room and will be toward the end of the event allowing for a relaxing finish to a special day of roaming and learning in our own back-yard. The sunset over the vineyard is a special bonus on an early autumn evening. The second trip including tour and dinner is $39.95 for all guests. Do not wait. Reservations may be made by calling the museum at 526-4222 and leave a message. Or you may stop by on Sunday’s in July from 1:00 p.m. to 4:00 p.m. when we are open and pick up your tickets. We will be excited to get you registered for this one time adventure, you won’t want to miss! Racing returns to Greenville, Ohio on Friday night, August 17 for the Great Darke County Fair’s annual week long race meet. Racing also takes place on Saturday, August 18, afternoon and night, and on Thursday, August 23 and Friday, August 24 in the afternoon and night. Afternoon post times are 1 pm with evening post times at 7 pm. Friday and Saturday night will feature the Ohio Colt Racing Association events. Friday night also will feature The Terry Thomas Memorial Signature Series Trot. Saturday night will feature the Rhys Bowman Memorial Signature Series Pace. The following Thursday and Friday night sessions will feature the Dr. HM Parshall Memorial Futurity. All the sessions will host several overnight events for both trotters and pacers. Closing night will feature the first edition of the Gene Riegle Memorial Open Pace. The event is open to the world, with no more than 8 starters; the top eight 2012 money earners entered will have preference, no trainer’s entries. The event is carded as one dash for a purse of $10,000. 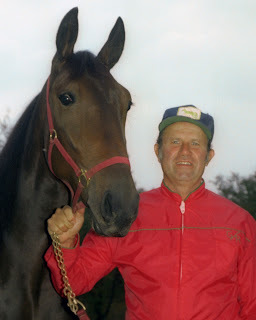 The week long racing meet is dedicated to the memory of Darke County native and Harness Racing Hall of Famer, Gene Riegle. The celebration will include a pictorial essay in the grandstand on race days which will give all the fans and friends a look back at the life and accomplishments of Gene Riegle’s harness racing past. Equine artist, Ann Lufkin has been commissioned by the Darke County Harness Horsemen’s Association to do a painting of Gene and Champion Arts Place, which will also be on display. The painting will be given to the family in a track side presentation on closing night. The family then will present the painting to the Harness Racing Hall of Fame and Museum in a track side presentation on Jug Day in Delaware, Ohio. Closing night will feature the giveaway to the first 1,000 fans buying a racing program a Gene Riegle Bobble head figurine. Nightly there will be t-shirt giveaways to the fans in the stands as well as the fans that line the track by the Darke County Harness Horsemen’s Association. Several amateur driving races have been carded and the Race Office is looking for both trotters and pacers to be used for these events. Anyone with a horse to be used for these events should contact Tim Harless at 937-564-3393. It is hard to believe that as this is written, Annie Oakley Days, The Gathering at Garst, and the Great Darke County Fair are just around the corner. On Sunday, July 22nd, the Elected Officials attended the North Star parade, and then later, competed in a “Family Feud” contest. The “Politicians,” (as we were called) consisted of Scott Zumbrink, Jim Surber and the 3 Commissioners, Mike Rhoades, Diane Delaplane, and Mike Stegall. Although we finished second, we all had a great time and the crowd seemed to enjoy it also. Thanks to the people of North Star for inviting us. We truly enjoyed it. Soon, all of our little community festivals will be over. Where has the summer gone? It won’t be long until the kids are back in school, and fall sports will be in full swing. The good news is that maybe August and September will bring some more reasonable temperatures for everyone. Speaking of the heat, the corn crop for the county has suffered some from the lack of rain. Agriculture plays such an important part in everyone’s life, and situations like this drought have really affected our main industry in Darke County. We will continue to monitor the situation and adjust our plans accordingly. In other news, because of the drought, we have finally completed repairs on the roof of the courthouse. It had been leaking for a while, so the lack of rain allowed Mid State Contractors to re-solder and repair the roof. Thank you to Mid State for completing and performing the work in a timely fashion. While Mid State was here, we had them install heat tape to the valleys in the roof of the Commissioner’s office. This will prevent ice from forming and blocking the gutters that cause problems with leaking. This was a preventative measure that needed to be done, and we think future problems will be solved with this step. We have a lot of repair and maintenance projects in the works and as soon as we get our estimates completed on repairs, and decide an order of importance for repair, we will let everyone know where we are heading. This is part of a plan the Commissioners have to upgrade our facilities, and to make sure that public buildings, which the taxpayer pays for, remain viable for years to come. In other news, On July 31st of this year, Darke County will receive its first check from the State of Ohio’s 2 new casinos. The payment of $46,097.34 is for the second quarter of this year. This money will be deposited electronically to us, and the Commissioners consciously did not plan for any money from the casinos when we did our budget. Some people might consider this a “windfall” to be spent, but the Commissioners will put this money back to be used at a later date as needed. We will not spend this money foolishly! This is the first in a series of quarterly payments from the casinos to the counties, and since we have no idea how much we will get each time, we feel it is best to just sit and wait. In a couple of years, Carol Ginn, the Auditor, and ourselves will have a better feel for how much we can expect each year. Until then, we will not count on anything. We feel this is a prudent choice. Our sales tax shows a slight improvement at this time, and we would be remiss if we did not thank the people of Darke County for continuing to buy locally. By buying locally, and enjoying all Darke County has to offer, you help everyone to prosper. This effort not only helps businesses, but it helps the Commissioners to better take care of the buildings, grounds, and services that we provide to the public. Thanks to all of you for this effort. Economically, Darke County continues to roll along at a very good pace. As this is written, Marc Saluk is working with a number of companies in helping to complete their projects, and with many of them on Workforce Development. We would like to welcome All-American Clothing in Arcanum and VPP publishing in Versailles into their new, larger facilities. Congratulations to both companies and may they both enjoy much more continued growth in the future. 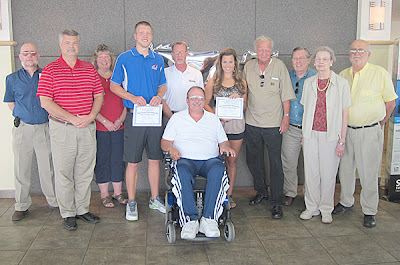 On Friday July 27th, Midmark Corporation was named the “Business of the Quarter” for the second quarter of 2012. Midmark continues to be a shining example of great businesses that have made a commitment to make Darke County better. Congratulations to this fine group of people in Versailles. Workforce Development continues as our top priority for now and the future. It is imperative that we develop a viable workforce for the many companies who are expanding and developing in Darke County. With the help of many of our companies, the schools, and the Partnering for Progress initiative, we will ensure that any company that wants to locate, or expand in Darke County will have a ready supply of workers for years to come. It must be noted that the workforce center is for the entire County. It’s location in Greenville does not make it exclusively for Greenville, nor is it just for students. This facility will be to help anyone of any age who wants to work to obtain the proper training. As the facility and curriculum evolves, it will be a vital cog in the retention and expansion of business in Darke County. Once again, Darke County is leading the way in this effort Statewide. Thanks to all of the involved for making this happen. This shows a true belief in the direction we are heading. One example of this effort involves one of our top employers, Midmark. Midmark has 4 engineering students from the Tech Center apprenticing at their plant in Versailles now. This collaboration will pay dividends for years down the road, and it is only possible through this co-operation. We have seen the problem, and we are rectifying it. We will continue to do so. GTI Incorporated is building a new facility in Anderson, Indiana. This facility will supply the Honda America plant in Greensburg, Indiana. This news may have caused some concern for some of our citizens in Darke County, but we can assure everyone that Greenville, Darke County, and the State were never really in the mix for this plant. We will continue to work with our local facility to ensure that the relationship that we have built with them will continue to grow and prosper for both entities. As you can see, a lot is happening in Darke County as fair time nears. We hope that everyone will plan to attend a Commissioners meeting in the near future. Won’t you join us? We meet publicly every Monday and Wednesday at 1:30 p.m., in the Commissioner’s Office at 520 South Broadway in Greenville, just south of the Courthouse. Plan to attend one, and have a great time at the Great Darke County Fair! 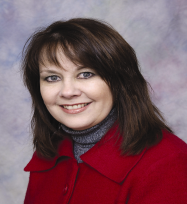 Jill Brown, RN, BSN, OCN, of Wayne HealthCare, in Greenville, Ohio, has been appointed as an official trainer for the Oncology Nursing Society Cancer Chemotherapy and Biotherapy Course, a comprehensive review for nurses who administer chemotherapy. The ONS Cancer Chemotherapy & Biotherapy Course is an in-depth program that provides registered nurses with the information they need to safely administer chemotherapy. The ONS Cancer Chemotherapy & Biotherapy Course is taught throughout the United States, as well as internationally, by approximately 1300 trainers. More than 80,000 nurses have attended this course since 1998. To become an ONS Cancer Chemotherapy & Biotherapy Course Trainer, registered nurses must be currently certified in oncology, have a minimum of two years experience in administering chemotherapy, and complete a trainer course. These highly qualified trainers assist ONS in setting standards of excellence in cancer care. Trainers are required to present at least one ONS Cancer Chemotherapy & Biotherapy Course per year, maintain a specified average on course evaluations, and comply with other course standards. To ensure the integrity of the program, trainers and courses are periodically audited by ONS. Oncology Nursing Society is a professional organization of more than 37,000 registered nurses and other healthcare professionals committed to excellence in oncology nursing and to leading the transformation of cancer care by initiating and actively supporting educational, legislative, and public awareness efforts to improve the care of people with cancer. ONS provides nurses and healthcare professionals with access to the highest quality educational programs, cancer care resources, research opportunities, and networks for peer support. 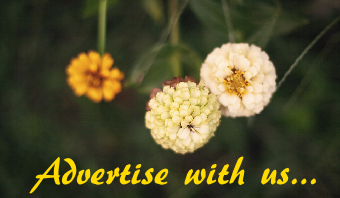 Learn more at www.ons.org. 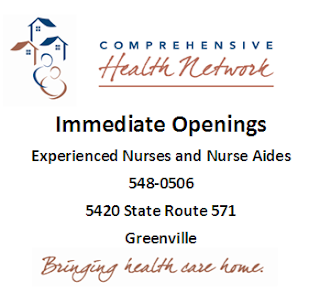 Jill will be holding classes for registered nurses who are interested in a comprehensive review and who have at least six months of oncology nursing experience. To register for class, please contact Jill Brown, RN, BSN, OCN, at 937-547-5079 or email at jill.brown@waynehealthcare.org. 2010 Little Miss Annie Oakley Lauren Wright presented Loretta "Annie Oakley" Jones with a rose. Lauren thanked Loretta for all her years at the festival and that she will be missed. The United States and Mexico have the highest rates of obesity. Poor feeding practices can lead to malnutrition, poor health, and even obesity. Breastfeeding can help reduce this risk because there is a strong link between a mother’s nutrition and health and that of her baby. Research shows that a baby not getting 6 months of breast milk has a higher chance of having ear infections, diarrhea, asthma, SIDS, and respiratory illness. Also mothers who do not breastfeed raise their risk of getting breast cancer and ovarian cancer. August is BREASTFEEDING AWARENESS MONTH highlighting the benefits of mother’s milk for a baby’s growth and the positive impacts on mother and family. Successful breastfeeding begins with the support of families, health care providers, governments, employers and communities. community contact the Darke County WIC office at 547-1776. Heat and humidity was summer. Cold and ice was winter. We opened the windows when it was hot and sticky and closed them when it was raining or cold and windy. I suppose air conditioning was when the windows were open and the lace curtains flapped outside in the breeze. Most families felt lucky to have a roof over their heads and to have survived The Great Depression. If it was hot outside it was hot inside. Heat and humidity were accepted with summer. Spring and autumn came and went without complaints. Spring was the time when the long underwear came off and were washed and hung out on the clothesline to dry. Mothers would store them away for the summer and hoped they still fit when autumn’s frosty mornings returned and school started over. Autumn was when kids carved faces in pumpkins, and played tricks on neighbors to get a piece of candy as a treat. Parents talked about the start of school — you had to try on this and that to see if it still fit and most of the time it didn’t. Boys wore high-top shoes called “clod-hoppers” that were a couple of sizes too big when first bought but shrunk over the summer and were too small by fall. Mothers traded used shoes to keep from having to buy new ones. Most fathers had the necessary cobbler tools to make new soles for wore out shoes. The trousers that had rolled-up cuffs in the spring were rolled down in the fall. Trousers from last year were too small and the pant leg came just below the knees—obviously too short. New patches were added where needed on overalls, shirts and sweaters. Most kids wore sweaters with holes worn through the elbows. Buttons were missing on clothes and safety pins were used to replace them. I have never seen a movie that did a country school justice. In the late 1930s and early 1940s, school was about making it to the 8th grade and nothing else. Most kids never went on to high school—parents thought an 8th grade education was enough educating. Kids needed to know how to hoe tobacco when it was growing. Boys had to toss hay from the ground up on the hay wagon. Children were expected to help on the farms and milking was something all children had to do. If you lived in town, like I did, you still had to feed the chickens or chop their heads off and dress them for the dinner table. Gathering eggs was a twice a day chore and we all had chicken houses for our meat and eggs. When the dandelions bloomed the last of May, school was out for the summer and we walked home with our grade cards that showed our final grade and told whether we passed or failed. The only thing good about summer was playing all day long or sitting on Harleman's front porch playing Monopoly while rain pummeled the snowball bushes. Darke County Park District and Elements Life have teamed up to bring you Yoga in the Park! The first class was a huge success! Due to the weather, the class was held indoors, but we are hopeful that the next class will be outdoors. Each class runs from 9:00-10:00am every Friday until August 25th. The class will be held near the Log House at Shawnee Prairie Preserve (4267 St. Rt. 502 West) with scenic views of the prairie and the woods surrounding you. Gentle and invigorating, this style of Hatha Yoga will warm our bodies up through stretching and breath work, then we will quickly slow things down to prepare you for any activities your schedule deems. Practicing yoga can help to improve your physical and mental health. Immersing yourself in nature while practicing yoga will only add to the benefits. Are you new to Yoga? This class is suited for all levels, beginners or advanced. If you have a mat, blocks or straps, bring them along, otherwise, some will be provided. Also bring plenty of water. In the event of inclement weather, the class will be held in the Nature Center. Suggested donation for the class is $10 per session or $45 to attend all six classes. All proceeds will go to the Darke County Park District. Take this opportunity to enjoy nature and yoga in a new and relaxing way. 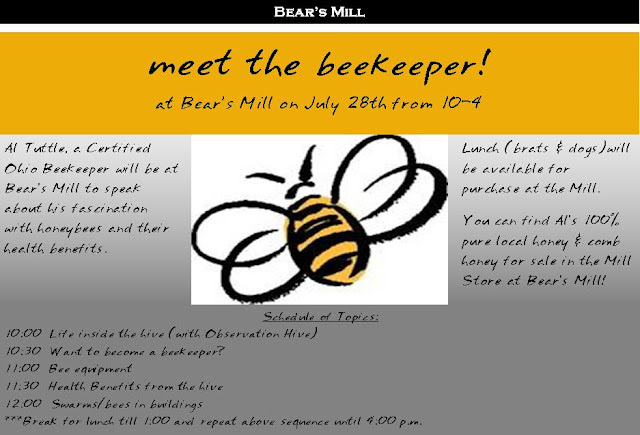 For more information, please call the Nature Center at 937.548.0165. The Darke County Parks would like to invite you to a FREE concert at Shawnee Prairie Preserve Outdoor Stage (4267 St. Rt. 502 West) on Saturday, August 11th at 7:00pm. Enjoy a musical journey as local musician, Bill Light, tells tales of his elaborate past. Many musical instruments and styles will be presented, interspersed with numerous stories from Bill’s book, “The Stories: a Journey Through Time”. Signed copies of his book will be available for purchase at the concert. All you need to bring is a blanket or lawn chair to sit on. While the prairies of Darke County no longer stretch for miles as they once did, there are still remnant prairie plots for us to “wonder” through. Join a Naturalist from the Darke County Park District for a leisurely walk through our “back 40” prairie at Shawnee Prairie Preserve on Thursday, August 9th at 7:00pm. This Naturalist-lead hike is completely free and there will be much to see! 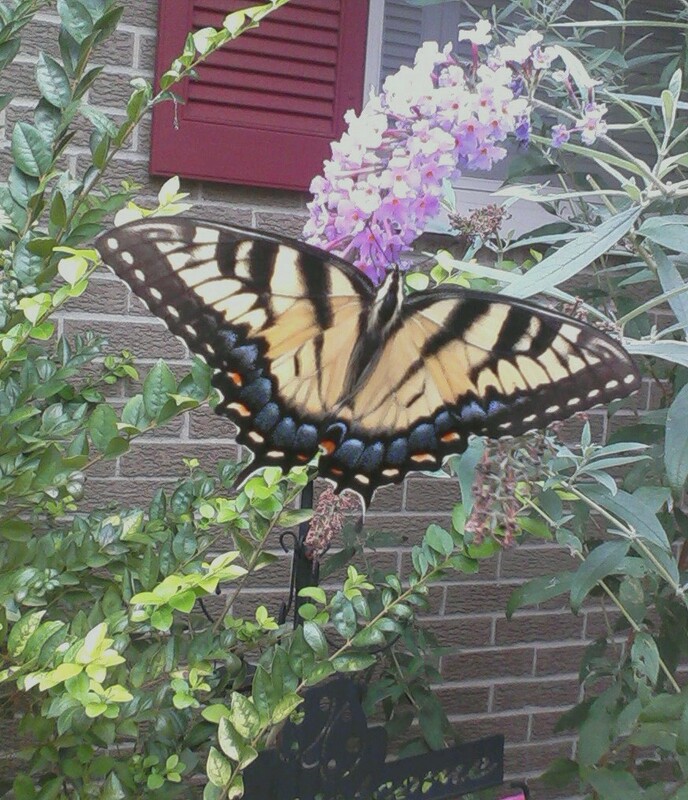 We will take a look at what flowers are in bloom, what birds are active and what butterflies are feeding. Dress for the weather, wear comfortable walking shoes, bring water, your binoculars and/or camera. Thanks to Raine and Terry Longfellow for sending the above photo of 2012 Miss Annie Oakley Elisabeth Harless helping to raise the American Flag at this morning's opening ceremonies. 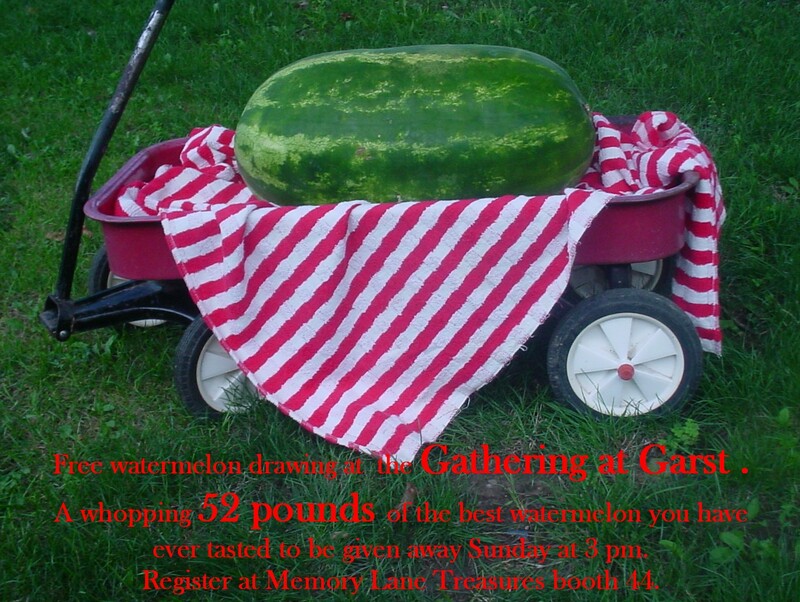 This 52 pound watermelon will be parked at The Gathering at Garst in front of Memory Lane Treasures booth #44. Come by and register to win it. Drawing will be Sunday at 3 PM. Why would, what is basically a jewelry booth, be giving away a watermelon, you ask? Well, it is like this: Terry and Raine Longfellow make a whole array of wonderful crafts from vintage items: silverware, feed sacks, old quilts, broken china, old lace, etc. So it is obvious we believe in preserving treasures of the past. As our name states: Memory Lane treasures by ReVamped Vintage we appreciate turning memories into treasures. One treasure from the past we really miss is good old-fashioned watermelon. The way they tasted before GMO foods took over our land. What to do! Ask your ‘truck driver son’ Chad Longfellow to stop in Missouri on his return trip and bring back a few watermelons. We told him we wanted big ones. Well, the four that weighed 32-35 pounds were pretty big, but 52 pounds. WOW. That one needed a special mission. For 2 days it will grace Memory Lane before heading home with some lucky winner. So come by and register. Are you going to the Olympics in London or know someone who is going? We have 4 tickets to 2 events that we purchased and will not be able to use them. 6:30pm and Saturday, August 18th at 9:30am. Use these programs as an “excuse” to schedule outdoor exercise time. Riding on the trail allows everyone to move at their own pace. Dust off that old bike and meet at the Gettysburg Access Point (Bridge Street) and ride a portion of the trail. Families are welcome. Don’t forget your helmet and water bottle! For more information on this and other programs offered by the Darke County Parks, visit our website at www.darkecountyparks.org or call the Nature Center at 937.548.0165. We hope to see you on the trails! Nature; From the Ground Up Summer Camp was recently held at the Darke County Park District. The week began underground. Campers got up close and personal with worms and also made a worm farm to take home. The next day, it was time to cool off and hop in the creek. The kids used nets and pond viewers to find out just what was living in Greenville Creek. Since we were already wet, they finished the day by playing with water balloons. Midweek, Naturalists got some of the animals out of their tanks in the live classroom, including the large corn snake which everyone was brave enough to pet! The following day was spent learning all about birds, butterflies and things that fly. The last day of camp was about the sky and beyond. Each child became a scientist and made fog and ice indoors. Then it was time to turn out the lights and learn about constellations. Everyone also got the chance to use a telescope. The whole week was having fun, while learning about the natural world that surrounds us. For more information about other programs offered by the Darke County Parks, visit our website at www.darkecountyparks.org or call 937.548.0165. There’s no break in the summer heat wave and the demand for summer blood donations is just as relentless. The Community Blood Center (CBC) “iFocus on Saving Lives” summer blood drive campaign is reminding donors to stay focused on the goal of a strong blood supply, and the possible prize of a 2012 “race red” Ford Focus. Everyone who registers to donate at any CBC branch or mobile blood drive now through Saturday, Aug. 11 will receive a free t-shirt. The gray shirt features a rare, two-sided design with “Blood Donor 2012” on the chest and the message “iFocused, iGave, I Helped Save a Life” over a blazing sun on the back. Focus on donating blood this summer and you could be driving a new Ford Focus this fall. Everyone 18 or older who registers to donate at any CBC branch or mobile blood drive now through Saturday, Sept. 1 is automatically entered in the drawing to win a new “race red” 2012 Ford Focus. The “iFocus on Saving Lives” Ford Focus summer giveaway campaign is sponsored by REACH Magazine and Dave Knapp Ford Lincoln of Greenville. Official rules are available at www.givingblood.com. 53 times a second... that’s how many wingbeats a Ruby-throated Hummingbird averages. 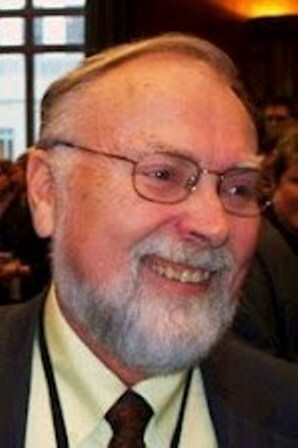 Join the Darke County Parks on Saturday, August 4th at 9:00am as we welcome Alan Chartier. Alan will once again attempt to band the “hummers” of Shawnee Prairie Preserve. After an introductory presentation explaining his on-going research on hummingbirds, Alan will check his specially designed hummingbird traps. This program offers a unique up-close look at our fascinating hummingbirds and a lucky individual may even get to help release a bird after banding. Due to the stress placed on the birds and bander, we regret that we must limit ages to 8 years old and up. Call the Nature Center TODAY at 937.548.0165 to reserve your spot as space is limited in this extremely popular program. The fee is $3 per person. For more information on this and other programs offered by the Darke County Park District, call the Nature Center or visit our website at www.darkecountyparks.org. Chris Norris sent along more photos, this time from tonight's Miss Annie Oakley finals at the fairgrounds. 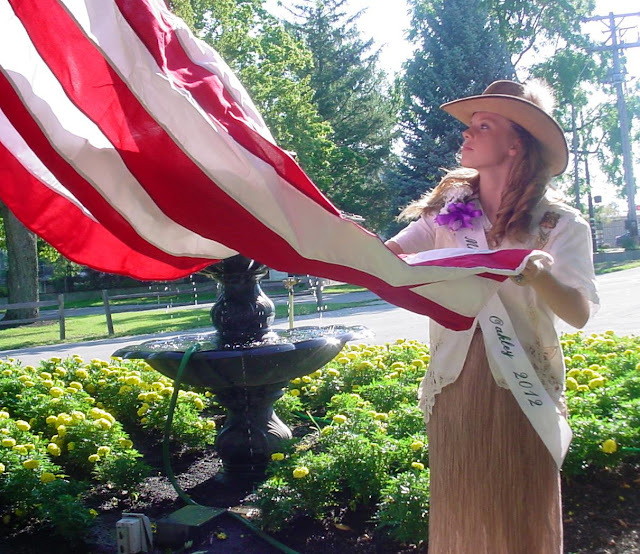 Elisabeth Harless became the 2012 Miss Annie Oakley after winning at the 105' range. First Runner up is Courtney Osborne, Second Runner up is Rachel Francis, and Third Runner up is Alyssa Baumgardner. Plenty of Festivities to Check Out This Weekend! As you should know by now, this weekend is the annual Annie Oakley Festival as well as the Gathering at Garst. Check out the event schedules below and find time to check them both out. "FREE with your paid admission to festival, register at headquarters"
7:00 PM Melodrama "youth building"
9:30 Parade Entertainment "In front of courthouse, downtown Greenville"
3:00 & 7:00 PM Melodrama "youth building"
Pre registration deadline is July 14 for the 5k run/walk in Downtown Greenville. 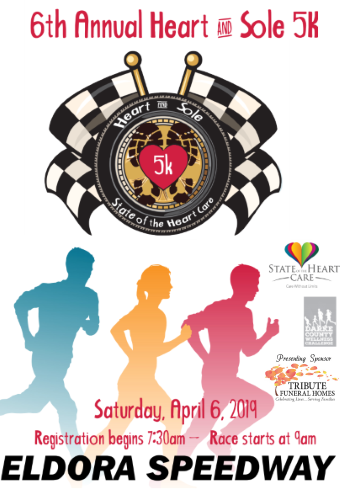 Race starts at 8;30am at the Annie Oakley Stature with kids fun run at 8:00. 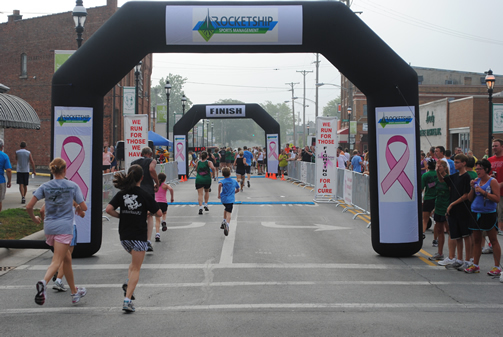 The largest 5k in Darke County every year the course is flat and fast and features a closed Downtown, the swinging bridge and park. Registration includes a custom technical shirt. A full awards ceremony will begin at Dave Knapp Ford at 11:00. Dave Knapp will be giving a CAR away to a lucky participant at the 5K Run. Must be present to win and must be 18 years of age. All eligible participants will be entered into the raffle if they are present at the run. 100% of the proceeds support the Breast Cancer Awareness of Darke County charity that supports those affected by breast cancer locally in the fight against breast cancer. who have undergone a Lumpectomy or Mastectomy for breast cancer. If you or a woman you know is in need, please call for more information. Great Lunch. Great Price. Great Cause. Ham/Turkey Wrap, Chicken Vegetable Soup, Oatmeal Cake. Club Croissant—ham, turkey, bacon, lettuce & tomato, Chicken Vegetable Soup, Oatmeal Cake. Chicken Caesar Salad, Chicken Vegetable Soup, Oatmeal Cake. And all proceeds will benefit the Resident Aid Fund. This fund was created to provide immediate assistance to residents in financial need; it offers peace of mind while preserving the quality of life and maintaining the dignity of those residents. 100% of the money donated to the Resident Aid Fund benefits our elderly residents who have exhausted their financial means. Brethren Retirement Community is a not-for-profit continuing care retirement community, a national eldercare expert, and the only Eden Alternative Registered Community in Darke County. To place your orders, please call 547-7655 no later than August 1st or email your orders to holly.hill@bhrc.org. Following an extensive search, Edison Community College has named assistant professor of mathematics Naomi Louis as the interim Dean of Arts and Sciences. Louis will officially take over the position on Aug. 1. Louis, who has taught at Edison for three years, came to the college to be an assistant professor of mathematics after teaching as an adjunct in Virginia for several years at various universities including Old Dominion University, and as a full time professor at New Horizons Regional Educational Center Governor’s School for Science and Technology. She has been teaching in mathematics at the college level since 2001. Louis attended State University of New York at Potsdam, receiving her bachelor’s and master’s degrees there. Edison’s associate of arts and associate of science degrees permit a student to complete the first two years of study for nearly any baccalaureate major and to transfer to a four-year institution if desired. Edison’s transftrer courses parallel those courses that comprise the first two years of a bachelor’s degree. Both provide an excellent academic background for students pursuing careers in fields such as science, business, technology and education. Additional degree programs within arts and sciences include economics, mathematics, history and psychology. “I’m hoping to help the division here on campus become more cohesive and build that positive team environment that we really strive for here at Edison,” she added. Louis is married to her husband Michael, who works at Wright-Patterson Air Force Base and has a stepson, John. Cancer Support Group to hold monthly meeting on Thursday, Aug. 2, 2012. Melissa Laux, licensed massage therapist will be speaking at the cancer support group at Wayne Healthcare on Thursday, Aug. 2, from 7 p.m.-8:30 p.m. Her topic of discussion will be "Reflexology: A Complimentary Therapy to Oncology Care.” She will give a short (10 Minute) description of Reflexology & the benefits for cancer patients, and then take questions. She will also offer a free 10 minute session to any one that would like to stay after the meeting. She will also bring some hand-out papers with information the group may take home for future reference. Cancer patients and friends/family are encouraged to attend. This support group is sponsored by the Cancer Association of Darke County. The association partners with United Way. They are not affiliated with the American Cancer Society or other organizations. Christine Yount, Executive Director of the association and Jill Brown, RN from Wayne Hospital will facilitate the meeting. For questions relating to the association or cancer support, please call the office at 937-548-9960. Two new full-time English faculty members will be joining the Edison Community College roster this fall, bringing with them a broad spectrum of experience and talent to share with students and the community. The new faculty are an important addition to Edison’s efforts to meet the growing needs of its post-secondary (PSEOP) and degree-seeking student populations and to expand on them. 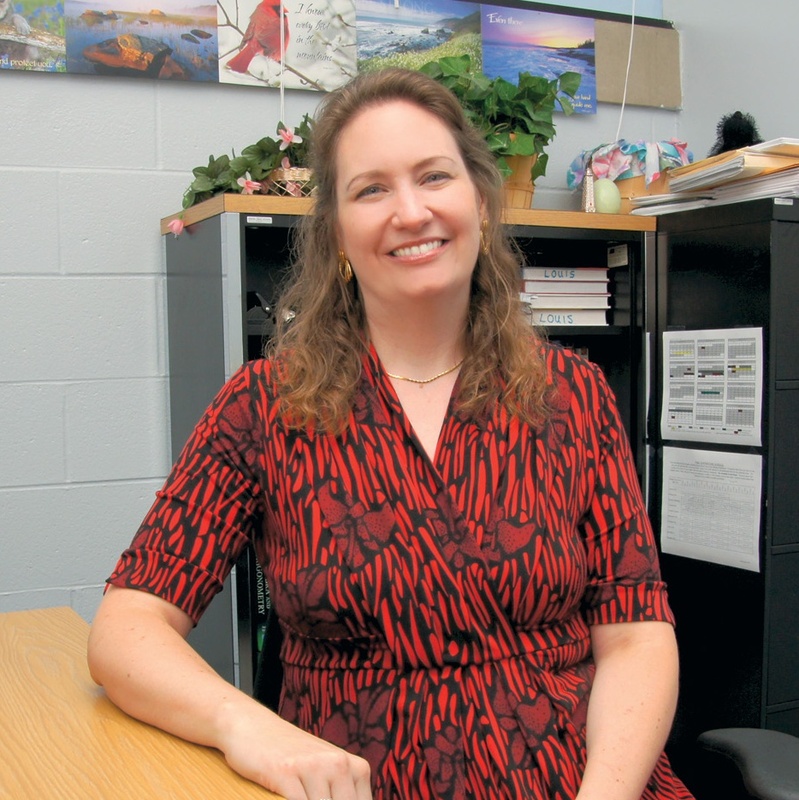 Becky Lindeman, who has been teaching at the college as an adjunct since January of 2011, came up through the ranks of Edison as a PSEOP student, continuing on to receive her associate of arts and associate of science degrees 2006. She later attended Wright State University, graduating in 2008 with a bachelor’s degree in English and in 2010 with a master’s in English Literature. 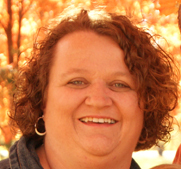 Lindeman has also worked in the Edison Learning Center and online as an eTutor since 2011. She currently lives in Piqua. William Loudermilk has been working at Sinclair Community College for the past eight years as a full-time English faculty member, teaching composition and directing the college’s writing center. In addition, he has taught part-time at Edison since 1998. 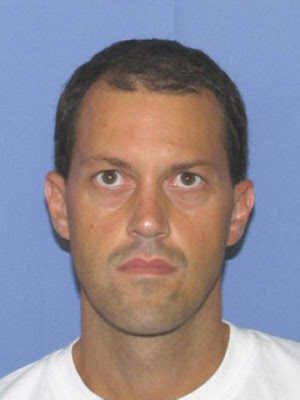 He is originally from Dayton and currently lives in the Huber Heights area. Edison Community College’s Associate of Arts – English, is a program that focuses on needed general education and introductory English courses that transfer as preparation for upper-level work as a junior and senior at a four-year college or university. The Associate of Arts degree can lead to four-year programs in pre-law, psychology, sociology, English, history, public administration, liberal arts, music, fine art, communication, and many other fields. 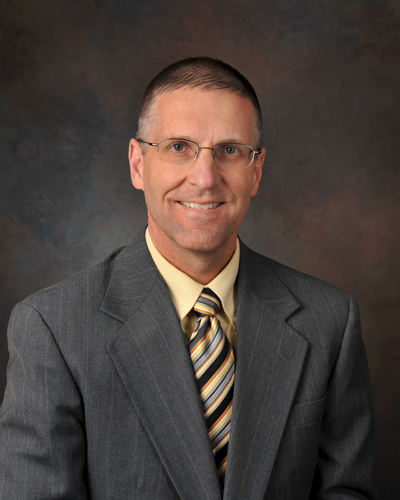 Please join Darke County Commissioner Mike Stegall as he continues to interact with the public at his “Coffee with the Commissioner” meeting August 11th at the Double M Diner located at 537 South Broadway in Greenville. The Double M Diner is in the Palace at the east end of the building. Commissioner Stegall will be there from 8:00 a.m. until 10:00 a.m. to answer any questions that people have concerning county government, or to inform people about happenings in the county. This is an opportunity to ask questions and discuss future plans for Darke County. Everyone is invited to attend and enjoy the morning with a cup of coffee with the Commissioner. This interaction with your County officials is important to make sure that your officials are doing what you, the public, expects of them. At several of these gatherings, other elected officials have shown up to help answer questions. Everyone will enjoy the atmosphere and the chance to communicate with your local county government, and to enjoy a good breakfast if you wish. These meetings are very informal and people can come and go as they please. Please join Commissioner Stegall August 11th at the Double M Diner in Greenville from 8:00 a.m. until 10:00 a.m. See you there! It's no secret that I'm a huge Reds fan like a large number of folks here in Darke County. We are in the midst of what is shaping up to be a special season. A winning team despite several flaws, production when it's most needed from guys who have been largely unproductive, and consistent outstanding pitching have defined the season thus far. For a franchise who always seemed to have either hitting or pitching and rarely both in the last decade or more, this year's club is doing what's important: winning, even without the best hitter in MLB in their lineup. 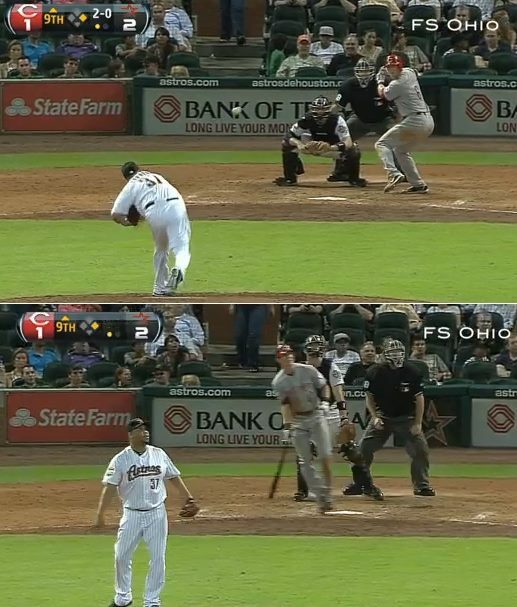 Thus, I'm going to share what makes me smile every time I see it: a couple of screen grabs I took of the replay from Tuesday night that succinctly captures the moment when Drew Stubbs took former Red Francisco Cordero deep to take the lead in the ninth (Cordero, you'll remember, was a primary source of anxiety and frustration in his tenure as Reds closer). Why Deja Vu? Stubbs beat Cordero again in the ninth last night with a two run double to take the lead for the last time. The play is about a tiny town in rural Ohio who’s growth and crime rate exploded with the ‘Dirt Rush’…kind of like a gold rush, but, well, with dirt! Bumbling Mayor Brown is up for re-election and to boost his votes, he hires a new town marshal and a new security officer for the local bank. But plans soon backfire when the new marshal’s crooked past is revealed! Both Kent and his father, Larry Holmes, are in the cast portraying Blind Bobby Bobbie and Mayor Brown. Other cast members include Simon Hoying as Spot Brown, the hero and Spring Koger as the lovely heroine, Norma Lee Boring. James Maloney and Jackie Middleton portray our villain, Hugh Morris and our villainess, Big Ol Mama Juju. Sandy Hartley is Mayor Brown’s wife, while Jackson Aukerman is Pepe Roni, the Mayor’s campaign manager. Matt Cline has been cast as Baron Von Achoo, a local man of the law. The local newspaper is run by Dusty Pants, played by Devon Persons. Taylor Dorn has been cast as Dusty’s wife, Anita Pants and Olivia Leeper is their daughter, Capri Pants. Kari Kramer and Jay-Paul Choudhary round out the cast as Sally Silence and the bank robber. The Annie Oakley Days Melodrama is free with your paid admission to the festival. Performances are Thursday, July 26th and Friday, July 27th at 7:00 p.m.; Saturday, July 28th at 3:00 p.m. and 7:00 p.m.; and Sunday, July 29th at 1:00 p.m. All melodrama performances are at the Youth Building. This year’s festival has many fun and exciting events, so come out to shop and eat, and then come hiss and boo and cheer at the melodrama! For more information check out www.darkecountycivictheater.org or call 937-337-2265. The Darke County Civic Theater is a non profit organization. Lisa is happy to announce her recent career move into freelance graphic design, but she is not new to the industry, She has more than 20 years combined experience in newspaper design and print, graphic design and commercial printing, as well as advertising and marketing. Her past work experience includes The Daily Advocate, The Early Bird, Cox Newspapers and The News-Gazette. Lisa's high quality products include everything from designing and printing business cards, flyers and brochures to tabloids, booklets and magazines. She also can offer her pagination and design skills to be outsourced to marketing, graphic and production departments, who need to save the cost of hiring a full time employee to design for them. Steve Baker at WHIO reports that a Troy man was convicted yesterday (Wednesday) of 3 counts of burglary and was immediately sentenced to 5 years in prison in Darke County court. 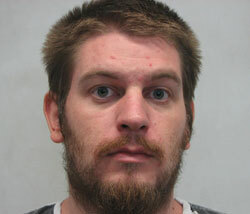 Keven Krug, 29, admitted to the three counts and was also ordered to pay $550 restitution to one of the victims. He and Manuel Monsivais, 31 and of Tipp City, were arrested in November after hitting 3 homes near Bear's Mill. Attached are 5 shots (excuse the pun) from tonight's shooting competition at the Fairgrounds. 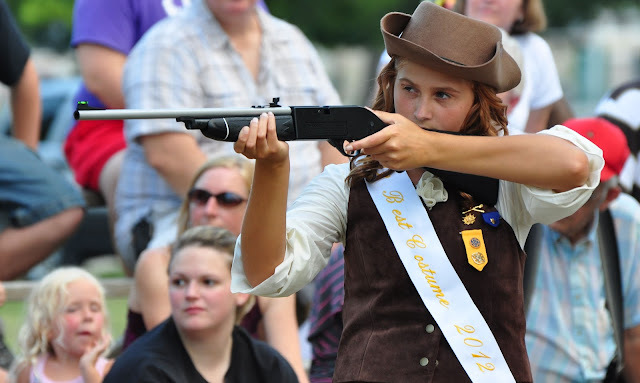 9 competitors shot tonight, with Miss Annie Oakley 2011 taking an "honorary shot" from 100 feet, to open the competition. They beat the storm tonight --- with 4 young ladies left, the next round will be tomorrow night (Thursday), starting at 6p.m. Courtney Osborne, Elisabeth Harless, Alyssa Baumgardner and Rachel Francis made the cut and will return to shoot tomorrow in the finals. For those of you who didn't follow along via my live updates in the chat, Greenville City Council and the Greenville Park Board met last night (Tuesday) to discuss the possibility of disbanding the park board and replacing it with a park advisory board that would fall within the city's governmental structure. The goal of any change would be to bring the operations of the park back under the purview of the city, with the street department assuming maintenance responsibilities in the park. As it currently stands, the park board is it's own independent entity, although it is funded either exclusively or near exclusively by the City of Greenville (it was noted that decades ago, when money wasn't as scarce, portions of the park budget were picked up by donors, non profits and other entities). Any change would be to allow tighter integration with the city and a sharing of employees, funds and other resources, presumably. There was a lot of confusion around the process to do this, and it was stated that this has been discussed on and off for many years (or even decades, perhaps). Camille Baker, Law Director for the City of Greenville, stated that the only way to disband the park board would be the same way it was created: a ballot issue generated by the petition of the population. So, council and the park board themselves do not have the ability to modify the organizational structure as it exists. It must be done via popular vote on a ballot issue that has to be the result of a petition. The petition would require signatures from 5% of registered voters in the City of Greenville. Further, the petition would have to be submitted to the Board of Elections by August 8th in order to be on the November ballot, making it (in my opinion) a long shot at best to happen anytime soon. There is still outstanding questions about who would generate the ballot language and how that process would work. The meeting included over an hour of public discussion on the idea. Many took the opportunity to stress what a great job Andy Mead, the only park employee, is doing given his limited time and resources. Several people expressed concern that the city may treat the park as a bi-product, or treat it with less care than those currently servicing it. This was met with responses from various council members and city officials stating that all city employees care deeply about all parts of the city and would approach any work in the park no differently than they do the rest of the city. Many stated the need to keep the park strong and operational, as it is a central part of our community, and others discussed what they are doing and have tried to do to bring new life to the park. Of particular note in the public comments were Shelley Miller and Amber and Rob Garrett. Shelley is running a swim program at the pool that was formed at the last minute and without advertisement. Despite those factors, the program's enrollment is full and has generated over $1,500 in revenue to the city via memberships to the swim program. She also stated that she has attracted kids from other communities, even communities with pools, who want to be a part of her program, and she believes the program could grow 5 fold if given time to organize and market it properly. She added that her program is proof that the pool can be profitable. Amber and Rob Garrett spoke about their efforts to receive an updated contract for the roundhouse/bandshell. This updated contract was the beginning step for a group of people to help form a "Friends of the Greenville City Parks" non-profit group. They had as many as 22 people involved to donate time and money to bring entertainment and events to the park. They first contacted the Park Board about this needed revision in January of 2012. They spoke of several hurdles and roadblocks they encountered in getting the information needed in order to proceed. They stated that in the 7 months they had been working on the project, nothing was able to come to fruition. They stressed the need for the various officials to communicate and work together to enable willing and able citizens to take action to bring life and growth to the parks, regardless of the governmental organizational structure the city ends up with. City officials plan to schedule another meeting in the next week or two in order to discuss details of what action can be taken and by whom. While I am very excited to start a new chapter in my career, it is with regret I will be leaving the administrative team of the City of Greenville. I sincerely value the time I have spent as the Director of Public Safety and Service for the City of Greenville. The opportunity provided to me by the city has been fantastic and I am truly appreciative. I would like thank Nancy Myers, Jeff Amick, and Camille Baker for all of their assistance, along with all of the employees of the city, and city council for the hard work completed to help the city move forward particularly in this difficult economic climate for all local governments. I would especially like to thank Mayor Bowers for his confidence in me, and his deep concern and care for the city of Greenville. I am extremely honored and excited to become the next Village Administrator of Versailles. The professionalism and pride already established by the Versailles community and current staff provides an ideal foundation for future success. The Gathering at Garst, a free community event is this weekend, July 28 and 29 at The Garst Museum in Greenville, Ohio. The Garst Museum grounds and Living History Encampment will be brimming with the sights and sounds of the past including merchants, live cannon fire, the echoes of muzzle loader demonstrations and the clip clop of horse drawn carriage rides throughout the two-day event. 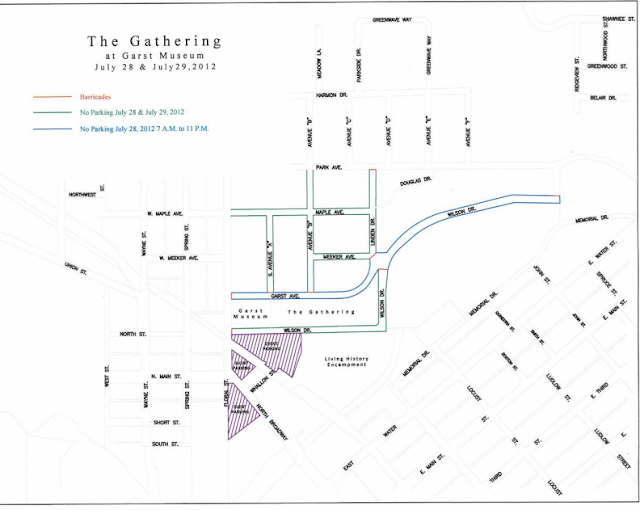 Parking at the Gathering at Garst will be available on the east side of the Garst Museum property at the intersection of Garst Avenue and Wilson Drive. This lot can be accessed at the end of Garst Avenue near the Health Dept. or from the Greenville City Park area. Additionally, parking is available south of the Garst Museum in former Buchy lot, and in the Hamilton lot off of Broadway. There is a $2.00 fee to park in these locations. Very limited handicapped parking for a $2.00 fee will be available on Wilson Ave. next to the museum. 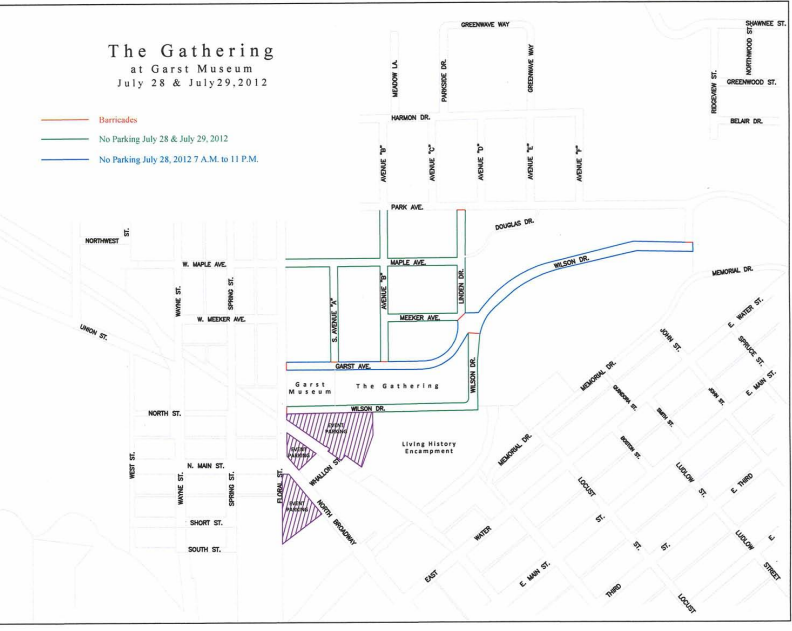 Handicapped access to the Gathering at Garst is assessable via Broadway. Please note that there is no parking in the neighborhood north of the Garst Museum. website to learn more about experiencing The Gathering at Garst during this FREE community event. The Wavaires will be having their annual Camp show this Friday at 7:00 p.m. at Memorial Hall. Doors will open at 6:15 p.m. Tickets will be sold at the door for $5.00. Attendees need to use the handicapped entrance at the side of the building. Some of the selections being performed are: Get On Your Feet, Born This Way, Forget You, Light of the World, Disco Fever, Radio, Let Me Be Your Star, Walk Like a Man, Run the World, Knee Deep, and several others. The Wavaires include: Sabrina Curry, Alex Davis, Caitlyn Eckstein, Jeanna Gnade, Sarah Green, Ashley Grote, Ben Hayes, Adam Hickerson, Hannah Hunt, Evan Kiser, Brittany Kuhn, Heath Marker, Brooke Netzley, Kira Ross, and Tessah Schinke. Joining the Wavaires will be 20 campers from Grades 4-8 with Dancing in the Street, Life's a Happy Song, and Dancing Queen. The camp is directed by Michele Smith with accompaniment by Terri Fryman. The sound and lights will be operated by Justin Westfall and Richard Kensinger. Returning to Greenville from New York City, is Greenville graduate Tyler Stickel doing the outstanding choreography. Campers participating are: Kylie Beisner, Meghan Bright, Courtney Bucklew, Shyanne Byers, Zack Coppess, Seryn Crawford, Zac Davis, Madison Garland, Travis Grooms, Hannah Gulley, Andy Hayes, Elise Hays, Rachel Hickerson, Molly Hunt, Amber Hutt, Justin McMiller, Jessica Mortensen, Jenna Netzley, Brayden York and Kassidy York. We have Bob and Kurt at the Darke County Animal Shelter. They are 3-month-old Australian Cattle dog mixes. They are both mostly white with a little brown and have short hair. They are sweet little guys and very playful. We also have their sisters Jenny and Tammy. One is gray and black and the other is red and white. They both have short hair. They are happy little girls and very playful. They are all current on their shots and would love to have a new home. We also have a Great Dane, a wonderful chow, a beagle, a Golden Retriever mix, 2 Boxers, a couple lab mix puppies and numerous other dogs. We also have cats and kittens for adoption. The public picked the name for our future Dog Park. There were hundreds of names to choose from. The new name is "Scentral Park". We would like to thank all of the people who submitted names. Construction of "Scentral Park" is moving forward. We are progressing toward our financial goal and hope to have the Park open before year’s end. We still need your support. Tax deductible donation forms are available at the Shelter. As we are nearing the end of summer and time for children to return to school, Kids Learning Place is taking final applications to begin the 2012-13 school year for preschoolers. Don’t wait there are just a few spaces still available for children to enroll. Call for information today to secure your child’s spot in the Head Start program. Preschool and early learning is important in the development of young children, and the Kids Learning Place centers in Greenville, Bradford, and Union City are the only centers in Darke County to earn a “Step Up To Quality” award from the State of Ohio. This award recognizes early childhood programs that exceed licensing standards. We have degreed teachers in every classroom, a research based curriculum, do developmental testing of children throughout the year and value parent participation. Our centers use the project approach to learning and provide individualized services for children and families. Kids Learning Place classrooms provide every child with a positive education experience. Head Start, a federally funded comprehensive program, is just one option for preschool education at Kids Learning Place. The eligibility for the Head Start preschool program is: a child must be between three to five years old and the family must meet federal income guidelines. The program also provides services to children of families that are homeless; children with disabilities are considered without income restrictions. Besides this classroom opportunity, we have a home based option available in many areas; a home visitor comes to the home each week to teach and demonstrate educational activities to the parent that they can use to help your child learn. Be sure your child gains the knowledge to succeed in school! For more information about this program or other full day child education/care programs call our toll free number 1-866-627-4557 for immediate contact. Also check the Web site at www.councilonruralservices.org. Council on Rural Services provides education, support, and volunteer services through Kids Learning Place™, Head Start, Early Head Start, Gateway Youth Programs, Achievement Center for Educational Success (ACES) and RSVP/HandsOn West Central Ohio program in their nine county service area. GREENVILLE, Ohio – The U.S. Department of Labor's Occupational Safety and Health Administration has cited dry ice manufacturer and distributor Continental Carbonic Products Inc. for 17 serious health and safety violations at the company's Greenville facility. Upon receiving a complaint alleging hazards, OSHA initiated safety and health inspections in March and subsequently expanded the health inspection under the agency's National Emphasis Program for Process Safety Management. Proposed fines total $60,435. "Failing to follow process safety management procedures to reduce workers' exposure to hazardous chemicals is unacceptable," said Bill Wilkerson, OSHA's area director in Cincinnati. "Employers have a responsibility to ensure that work environments are healthful and safe." Ten serious health violations involve failing to establish an adequate emergency action plan, provide an emergency shower, follow up on process hazard analysis recommendations, provide adequate emergency shutdown procedures, provide sufficient training on standard operating and mechanical integrity procedures, adequately manage change procedures and properly handle small chemical releases. 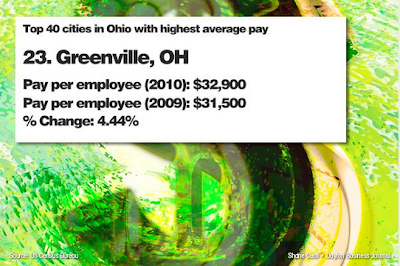 The Dayton Business Journal posted a list of the top 40 cities in Ohio based on the average salary of employees (this is of all residents in the city and its metro area, not just public employees) based on data from the US Census Bureau. Greenville (surprisingly?) landed near the middle of this list at number 23 with an average 2010 salary of $32,900, which represents a slight increase over 2009. Click here to read the article and view the slide show of the entire list at the Dayton Business Journal. Fox59 out of Indianapolis is reporting that GTI is set to begin construction on a new 150,000 square foot plant in Anderson, IN with a target of beginning operations in January 2013. The plant is expected to create 300+ jobs by 2016. "This new plant is needed due to capacity limitations and a tight labor market in Greenville, Ohio," said Bill LaFramboise, executive vice president of GTI. "It will also provide us with improved efficiencies and flexibilities to meet our customer's needs. We chose Indiana, and specifically Anderson, because of the availability of a good site, cooperative government and a plentiful workforce." Click here to read the article at Fox59.com. Several strong storms rolled through this morning. I've heard of a transformer being knocked out downtown, cutting power to parts of the town (but I'm not sure how widespread: as of 12:07pm, DP&L reported only 56 addresses without power). 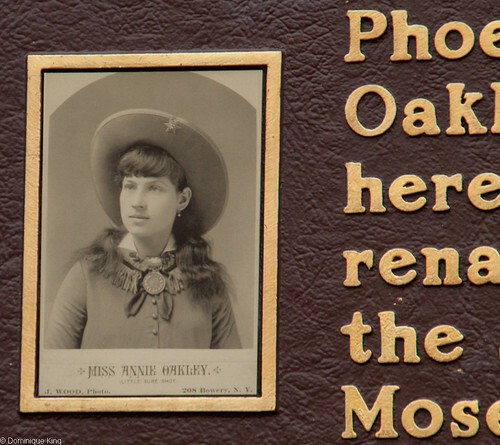 DiscoverOhio.com, Ohio's State Tourism Website, recently featured Darke County in a blog post focusing on our own Annie Oakley. It simultaneously tells the tale of "Little Miss Sure Shot" while also promoting Annie Oakley Days (this weekend! ), Garst Museum, and other attractions in our area. Chris Norris returns today, this time with a photo of the sun disappearing at the end of a day last week. Do you think there are people who see images like these and think "how lucky would we be to live someplace where we could see things like this nearly every day?" A tragedy on Labor Day of 1945 happened when The Spirit of St. Louis and an automobile collided at the Albert Road crossing. Look magazine did a story about the accident and had a photograph of a baby setting on the street crying. I never knew who that baby was and realize it is now around 60 or 70 years of age. Makes me think the photographer was a man because a woman wouldn't let the baby set there on the street crying but would have scooped it up and tried to calm it down. Instead the man must have walked around and looked at the baby from different angles before taking the photo that appeared on the cover of Look. The trains that came through Brookville traveled fast. You could stand there and watch the passengers eating in the dining cars. Their faces were mere blurs and passed before you could even react. Some trains wrecked along Cusick Avenue and it was not uncommon to hear one go off the tracks and make a thunderous noise as the steel wheels bounced across the cross ties. I remember one train was backing up pushing an empty car that ran off the tracks and nearly hit the grain elevator. It made a terrible noise. The fast train that crossed Route 40 used to mow people down like wheat on the Preble County Line Road crossing south of Verona, Ohio. Somebody was always getting killed there. My son, Chris, told his younger sister that trains could jump off the tracks and travel across the grass right into our house. Our daughter told us that she was always afraid when she heard the whistles and was relieved when the trains stopped running. Brookville isn't quite the same since the trains stopped. 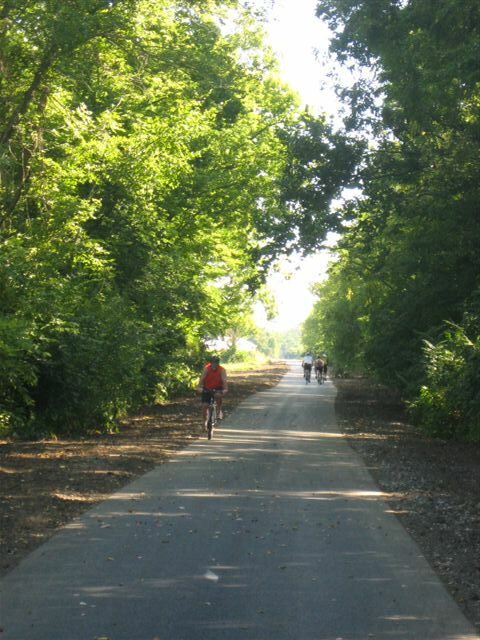 The rails have been replaced with a beautiful bike path that runs from Trotwood through Brookville to Verona. That was the best thing that happened to the old rail line. My home county, Darke, ignored pleas to convert the old D&U roadbed into a bike path. Senior Scribes and family members join Dave Knapp, Evan Barger and Jenna Dowler as the college-bound athletes receive their scholarship checks and certificates. Front: George Starks; Back, left to right: Kurt Fritsch, Dale Barger, Rita Barger, Evan Barger, Dave Knapp, Jenna Dowler, Bob Robinson, Al Greiner, Lois Wilson and Al Bliss. Jenna Dowler, Greenville High School, and Evan Barger, Tri-Village High School, received the first annual Dave Knapp Business Scholarship for Academic & Athletic Excellence. The presentation was part of the Senior Scribes Scholarship Fund’s Business Scholarship Program. Dowler and Barger were recognized for their individual efforts in the classroom and in the field of athletics. Dowler excelled in Greenville High School’s girls basketball and cheerleading. Barger excelled in Tri-Village High School’s boys basketball and golf. The two athletes started playing basketball at a young age and helped lead their respective teams during the 2011-12 basketball season. Both Dowler and Barger have family members who excelled in sports as Kevin Dowler played basketball at Tri-Village while Dale Barger excelled in sports at Covington. Knapp has been an active supporter of the community that has supported him through his sponsorship of a variety of activities and organizations. He has been especially supportive of the community’s youth. Through the support of various Senior Scribes Scholarship Fund programs and sponsors in the local community, SSSF has been able to provide scholarships and other college aid to 16 young people since 2009. Some students have received additional aid as they continued their college careers. All scholarships have as their fundamental requirement academic achievement.